Recurrent tenosynovitis about the hand and wrist fortunately is an uncommon problem. For stenosing tenosynovitis, the usual culprit for continued symptoms is incomplete release. At this point, the appropriate surgery is to repeat the release and make sure that there are no further constricting points about the flexor tendon sheath. Of course, the A2 pulley needs to be preserved and protected, but the A0 and A1 pulleys should be thoroughly released. The other condition discussed is deQuervain’s tenosynovitis. The most common reason for failure of this surgery is a hidden slip of tendon in a separate compartment that was not released. Other potential causes include tendon subluxation about the radial styloid. Reoperative options in these scenarios include decompressing all of the tendons and making sure no tendons are left in any separate compartments. For tendon subluxation, a slip of the brachioradialis tendon can be used to reconstruct the retinaculum. Ultimately, if the patient still has symptoms that cannot be completely explained, but continue to appear to be deQuervain’s tenosynovitis, a slip of tendon can be resected, thereby decreasing the cross-sectional area going through the first dorsal compartment. 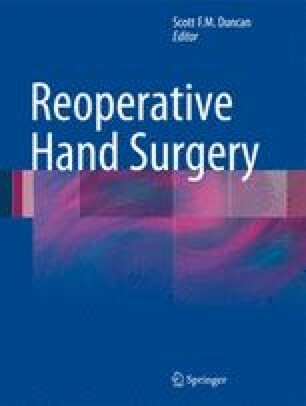 In general, the harder part of these cases is trying to reassure the patient that despite what is normally viewed as an “easy” surgery, technical challenges do occur and fortunately in most cases reoperative surgery in these situations does provide improvement in the patient’s symptomatology.